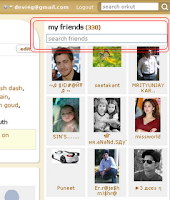 One of recent update from orkut that now you can search your friends directly from the home page. Now a days orkut is rolling out new features daily. 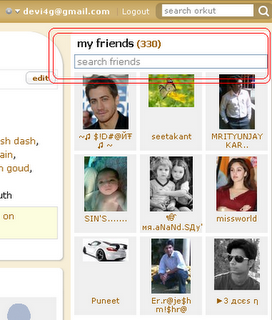 One of the hot feature is you can search your friends from your home page . A search button is on the above of my friends list (see image). As before you have to go to yours friends page and have to type the friends name and hit enter. But this widget suggests the friends as you type 2 or 3 letters. > Scraps text inside email. > Stop others finding you on orkut by searching your email. > Share photo with only selected friends. > Chat with your friends right inside orkut page. > Scheduled events , create and invite your friends. > Photo comments in Updates. > Conversation feature in scraps. thats very cool. i have been looking for that for a long time now finally they have rolled it out. net thing i want is a list of my friends who are online so that i don't have to search everytime. I also wish the same. Orkut just launched the integrated chat feature, so who is online must come soon. This is great advice! Very honest and practical.I really enjoyed this post.